Girls Inc. of Tarrant County took its "Strong, Smart and Bold" message to the streets of downtown Fort Worth, for their Day of the Girl Celebration on Friday. 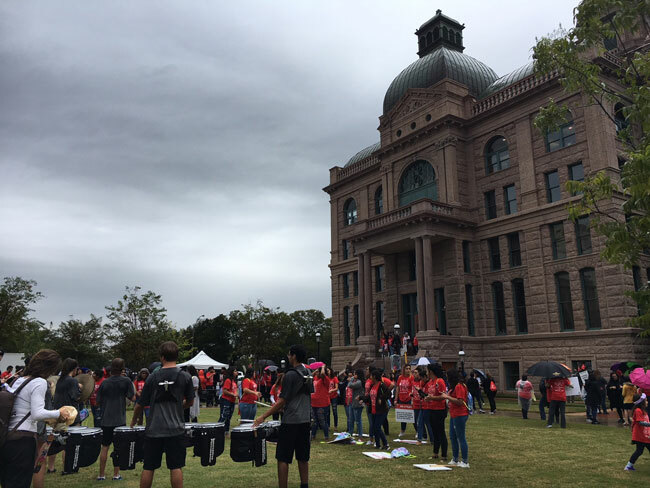 The afternoon rain couldn't dampen the spirits of the nearly 13-hundred people who gathered around the Tarrant County Courthouse. Girls, prominent women, men, corporate groups, community networks and schools from across the county participated in the event to promote empowerment and advocacy. Minnah Aburashid, 13, said she took part to show her strength. "Just because I’m a girl or I’m a different gender, or race or anything, doesn’t mean that I can’t do something that other people can," Aburashid said. Jennifer Limas, CEO of Girls Inc. of Tarrant County, said Fort Worth's Day of the Girl event has been gaining traction, with more involvement each year. "I think that people are looking for a positive way to express their desire to advocate for girls in our community and stand up for the rights of girls," Limas said. In 2011, as a result of youth advocacy around the world, Oct. 11 was recognized as the International Day of the Girl. The mission is to help galvanize worldwide enthusiasm for goals to better girls’ lives, providing an opportunity for them to show leadership and reach their full potential. Festivities kicked off at 2 p.m. with a rally on the courthouse steps. To commemorate the day, a proclamation from the City and Girls Inc. Girls’ Bill of Rights was read aloud. Then participants and supporters lead by drum lines and cheer quads marched down Main Street to take part in a celebration in Sundance Square. NBC 5 is a proud sponsor of Fort Worth's Day of the Girl Celebration. Coral Simpkins-Mims and Valerie Salter with Girls Inc. of Tarrant County contributed to this report.